Challenger Sale: Is it okay to let prospects struggle? He watched every day, waiting for the butterfly to emerge. 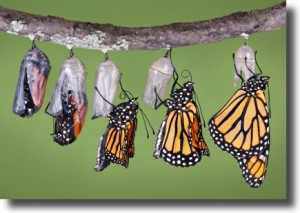 One day it happened, a small hole appeared in the chrysalis and the butterfly started to struggle to come out. The boy was so concerned that he decided to help. He ran to get scissors and snipped the chrysalis to make the hole bigger. With that, the butterfly quickly emerged! But neither happened! The butterfly spent the rest of its life crawling around with a swollen body and shriveled wings. I am not the author of this story, nor will it be a new story for most of you. But it appropriately sets the stage for this very important question. Is it okay to let a prospect struggle? We hate to see anyone struggle, and for many, the temptation to bail prospects out after asking a difficult question is more than some can bear. For The Challenger Sales rep, this is most common at the point of the Reframe. In fact, this is intentional as this triggers the Constructive tension that needs to occur in order for the Status Quo to be disrupted. But for the rep that is still learning the Challenger Sale, you may feel your Reframe was inappropriate because the prospect squirms to answer or respond. Sure, after hearing our different point of view, we would love to hear them say, “I never thought of it that way before” as they look upon us with amazement for our brilliance and intellect. It rarely happens that way. These are signs of constructive tension as the prospect begins to struggle with their current circumstances and that which you have just shared that caused them to rethink everything. Allowing this early struggle to happen is a great sign as it ripens people to hear truth. Last week a colleague and I met with the owner of a very successful organization. She is about to release a ground-breaking book, and asked for us to consult on her launch plans for a successful release. In evaluating the initial plans for release, I quickly saw that the current course would result in a book launched on an ill-prepared audience. She immediately disagreed, sharing that the audience has been dying for an answer, and the research they had done would be the solution to their problems. As difficult as it was for her to hear, I shared honestly with her that she had the wrong perspective as her focus was too squarely placed on selling the book. She agreed that it was with a hint of, isn’t that why we are meeting. I shared that I was more concerned in establishing her as an authority on the issues that she would address in the book. Without doing so, the book would be introduced to readers that didn’t know they should read it. She still pressed that this audience was ready for the answer. I responded that while the target audience was indeed, ready for an answer, they were not ready for her solution. I proceeded to lay out some action items that would build a foundation and a platform for her to speak. This would be followed by a hungry audience clamoring for her solution by the time of release. When debriefing with my colleague after the meeting, he asked me questions around her hesitancy with our proposed next steps. I explained that the hesitancy was that she is trying to sell a book, and we are trying to sell her as a credible authority to have written the book. She sees herself as credible and an authority from her own perspective, but her perspective is still narrow. In order to broaden her view, I had prescribed steps that she committed to, which would expose the vulnerabilities in her thinking. Simply explaining what will happen won’t work. She needs to experience that and struggle with that to ripen her for what she really needs to do. Reducing her struggle would result in a poor book launch and threaten her credibility as the authority in this area. As one final illustration of the benefit of the struggle, I would like to share a story stemming from the Biosphere 2 project erected in Oracle, Arizona in 1987. Following is an excerpt from Dr. James A. Danoff-Burg, Associate Research Scientist at Columbia University, on the unintended consequences to plant and tree life due to the absence of wind. What does it look like to shelter prospects? This may come in the form of answering [or changing] your question to the prospect because they appeared uncomfortable. A more subtle form of sheltering a prospect from the ‘struggle’ is to keep the conversation agreeable throughout your dialogue. Remember, the Biosphere was agreeable and as a result, also detrimental. The lesson of the trees from the Biosphere is that quick and fast growth, does not mean sustainable growth. Question: Are you sheltering your prospects in the same manner the trees in the Biosphere were sheltered? If so, the consequences to them can be quite severe. This article makes the readers think in a different way. Thanks as always for your thoughtful comments, Carmit. Good to hear from you! That’s a great saying, Daniel. Thanks for passing that along and for your comments. Yes, I agree Brian. Thanks for passing along that excellent resource.